In just a matter of a couple of years, Bluetooth speakers have gone from an interesting (and expensive) option to mainstream. Prices have come down quickly, and the variety of designs for the speakers has grown dramatically. In all cases, you get the benefit of being able to play your music on your phone without the inconvenience of having headphones. You also get a speakerphone, although the quality of the audio can vary dramatically from Bluetooth speaker to Bluetooth speaker. This accessory is best purchased in a brick-and-mortar store where you can listen to a variety of choices. Although syncing with a number of speaker choices can be tedious, it’s the only way you’ll know if a particular Bluetooth speaker meets your needs. Although sound quality is essential, the folks in the industrial-design department have been having a lot of fun coming up with ways for the Bluetooth speaker to look. The figure shows a range of options for the most popular form factors. Some cars have a built-in Bluetooth system within the car stereo that connects to a microphone somewhere on the dash as well as to your car speakers. It’s smart enough to sense an incoming call and mutes your music in response. If you don’t have such a setup, there are lots of good options for car speakers. A closely related accessory is a car mount. A car mount will hold your phone in a place you can easily observe as you drive. The mount attaches to an air vent, the dashboard, or the windshield. You could always put your phone on the seat next to you, but that’s for amateurs. Instead, offer your phone a place of honor with a car docking station. It makes accessing your phone while you drive safer and easier. Some see getting a car mount as a luxury, but my view is that if you need to upgrade your navigation software, you need a vehicle mount. Be sure to put away the docking station when you park. Even an empty docking station is a lure for a thief. The figure shows the Samsung Vehicle Navigation Mount. It costs about $100, and you can get it at your carrier’s store, RadioShack, Best Buy, or online at Amazon.com. It includes a wireless charging pad. More economical vehicle mounts are available that do not include a wireless charging pad. When shopping for a car mount or a bike mount, be sure to consider the extra girth associated with a case. If you don’t use a case (which is a mistake), you just need to be sure that the mount is compatible with a Galaxy S8. If you have a case on your phone (which is anything but a mistake), be sure the mount will work with the Galaxy S8 and the case. Those industrial designers have certainly gone crazy with Bluetooth speakers. They have also been having a field day on wireless charging options. 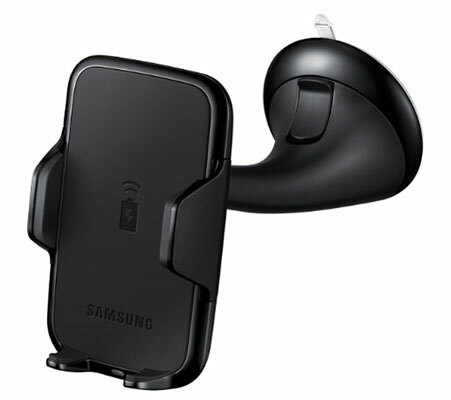 For example, the Samsung Vehicle Navigation Mount shown has a built-in charger. Most wireless charging mats are designed with the idea that you can place your phone on the mat, and technology will do the rest. You can get a standard Samsung wireless charging pad for about $50. Samsung also offers the Fast Charging pad, which will charge your phone from stone-cold dead to 100 percent in just a few hours. This capability costs a little more, closer to $70. If these are too conventional for you, more options are out there as well. You can go colorful, high-tech, or back to nature. Your choice. One feature that some people just cannot get over is having tactile feedback from a keyboard, even a real keyboard. This harkens back to the day when Blackberry was the “it” phone. Fear not! Samsung has a solution for you with the Galaxy S8. 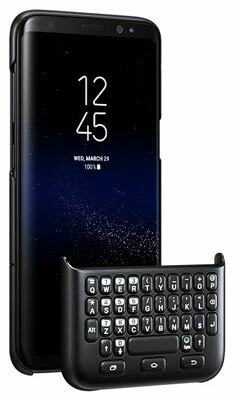 It’s called the Keyboard Cover, and it snaps onto your S8. Your phone knows it’s there and covering part of the screen, and the phone immediately condenses everything to the top part of the screen. When you remove the keyboard cover, you get the whole screen back automatically. This product is ingenious. It only works with the S8 and not the S8+. Unlike your old Blackberry, the keys are not backlit. Make a statement with wraps. Not the sandwich kind of wraps. this kind of wrap lets you customize the non-glass portion of the S8. The Samsung Galaxy S8 is very attractive, but you can spruce it up with an adhesive covering called a wrap from Skinit. These designs can express more of what is important to you. As a side benefit, they can protect your phone from minor scratches. The figure shows some design options for a skin. It comes with cut-outs for speakers, plugs, microphones, and cameras specifically for the Galaxy S8. Putting the skin on is similar to putting on a decal, although it has a little give in the material to make positioning easier. The skin material and adhesive are super high-tech and have enough give to allow klutzes to fit the nooks and crannies of the phone like an expert. 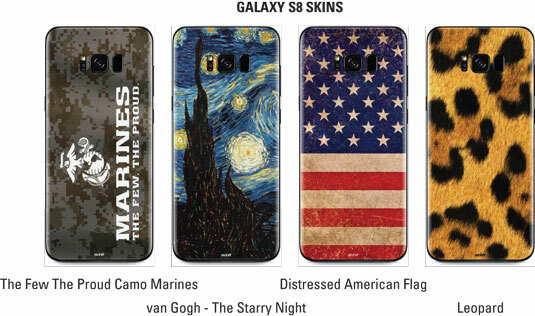 If you’re not crazy about Skinit’s designs, you can make your own with images of your own choosing. Just be sure that you have the rights to use the images! You look wonderful: custom screen images. 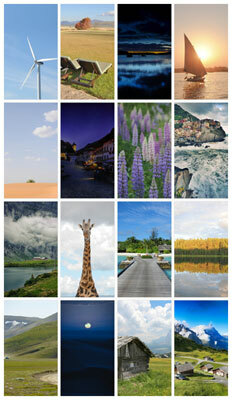 Choose a neutral background image (similar to the backgrounds on many PCs) from the Wallpaper Gallery. The figure shows a selection of background images that are standard on your phone. Any picture from your Gallery can be virtually stretched across the seven screens of your home page. Opt for a theme that changes the background and fonts. The pictures from your Gallery and the Wallpaper Gallery are images that you can set by pressing and holding the Home screen. In a moment, you see icons appear. Select Wallpapers and pick the image you want. The themes take it to a different level. In addition to the background, the phone will change the fonts and many of the basic icons. A few samples also come on your phone. You may be a pink kind of person or a space nut. If these options aren’t to your taste, tap the Store link at the top of the page to see a range of options. If you do not see one you like today, be sure to check back as developers are adding new themes all the time. Wearables are a class of mobile accessories that have been getting a lot of attention lately. For the most part, wearables are connected via Bluetooth and typically worn as a watch, although you can wear some sensors in athletic shoes. 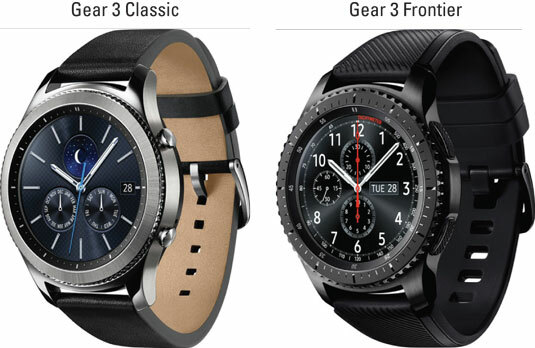 Samsung offers its wearables under the brand name Gear. In addition to telling the time, these wearables give you notifications, weather, and texts and track some relevant information, such as the amount of exercise you’ve done. These images look like conventional, but stylish analog watches. When you rotate the bezel on the watch face, it shows you texts, a phone dialing pad, your altitude, and the useful information that would otherwise be shown on your phone. How cool is that?! Use your phone as a PC. Your phone has all the computing power of a PC. Wouldn’t it be nice if you didn’t have to carry a laptop? 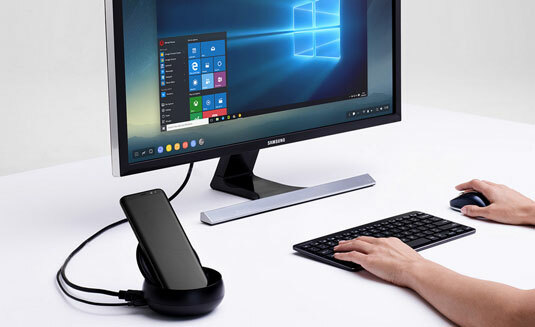 Enter the Samsung Dex. The Dex Docking Station may look like a conventional charging station, but it’s so much more. When you put your phone on the docking station, you can use a full keyboard, mouse, and screen as if it were a PC! The docking station has an Ethernet jack, two USB ports to support a keyboard and a mouse, and an HDMI port to connect to a full screen. What you plug it all in, you get the full functionality of a desktop. This is much smaller and more convenient than lugging around even the lightest laptop.